In a public service announcement, Hillsborough Sheriff Chad Chronister also urges teens to avoid other distractions, such as texting and taking ‘selfies,’ on the way to prom. HILLSBOROUGH COUNTY – The Hillsborough County Sheriff’s Office is raising awareness about the fatal effects of drunk driving through a public service announcement in time for prom season. The PSA, featuring Sheriff Chad Chronister, packs a powerful message: Don’t let the most memorable night of high school be defined by tragedy. 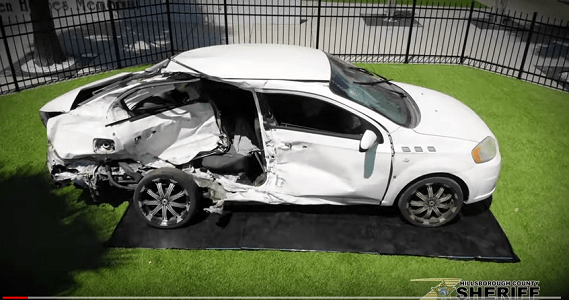 The video showcases a mangled vehicle, courtesy of Stepps Towing, to give students an eye-opening look at how quickly they can be involved in a fatal crash if they are distracted from the road or driving under the influence. passengers in their vehicles and avoid other distractions, such as texting and taking ‘selfies’ on the way to prom. In order to best reach high school students, the PSA has been posted on all of the Hillsborough County Sheriff’s Office social media accounts, including Facebook, Twitter, Instagram and Youtube. The Prom PSA can be viewed and downloaded on the HCSOSheriff Youtube account: youtube.com/watch?v=9OzxzDEgKb8. Photos are screen captures from video. Video courtesy of the Hillsborough County Sheriff’s Office. In a public service announcement, Hillsborough Sheriff Chad Chronister also urges teens to avoid other distractions, such as texting and taking 'selfies,' on the way to prom.